Shilaki from Persian Azerbaijan, dated 1342 (1923 in our calendar) and with a woven signature. This is a rare embroidered jajim, worked in five panels of about 31 cm width, on which the women in the household of “Ojak Ghiraghy” prepared bread. 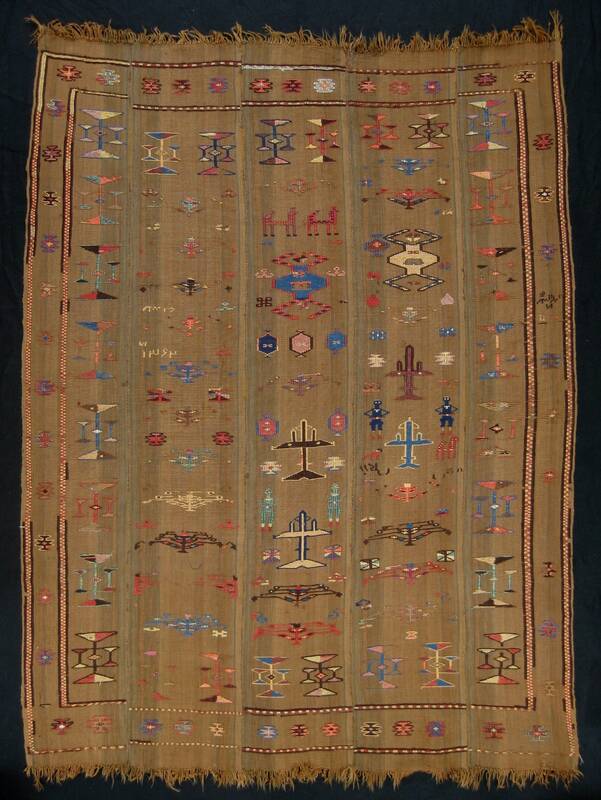 The embroidery depicts people, animals and geometrical motifs, some of which are reminiscent of aeroplanes but almost certainly are not, given the date of the weaving. The majority of the geometrical motifs are virtually impossible to identify at this point. Wool embroidery on wool, with small areas of abrasion in the embroidery, but in good condition overall.